Learn how to make pecan caramel cheesecake recipes; it make also be called praline or butter pecan. Whenever I hear “praline” I immediately think “pecans” as I am sure most of you do. I do love pralines and any recipe with “praline” in it. Well here is the real truth of the story. The pecan tree is the only major nut tree native to North America so learning how to make pecan caramel cheesecake recipe seems a natural for us here in the United States. The name “pecan” is a Native American term and refers to being hard and requiring a stone to crack it open. Although it is said to be native of my home state of Ohio and neighboring Indiana, Illinois and Iowa, I never saw them growing there. I am sure if they grew there I would have found them when I learned how to make pecan caramel cheesecake recipe and for all my other baking; maybe they were scattered about. I know the pecan tree to be very famous in the Southern states like Georgia, Alabama, Mississippi and Louisiana. 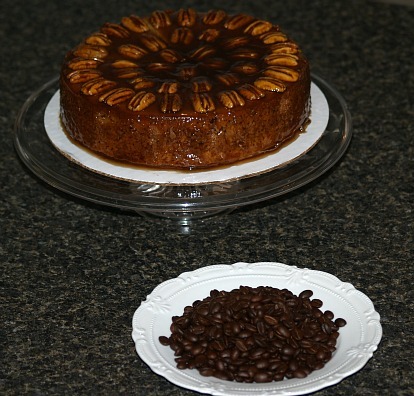 I use a lot of pecans in my cooking; I especially love the rich buttery taste in desserts. I have been able to purchase pecans in bulk throughout these southern states. Now to pralines; it only seems a natural match to put the rich buttery taste of pecans into pralines. The truth is that they never started that way. The original pralines came out of France in the seventeenth century. They were actually whole almonds coated with a caramelized sugar; later some started to use hazelnuts. Many French people settled in Louisiana bringing their recipes and techniques. They taught the locals things like how to make cheesecake and how to make pralines. The French also developed the ultimate cheesecake which contain the French meringues. In this region sugar and pecans were so abundant. Chefs around this area began making the French recipes utilizing local products. 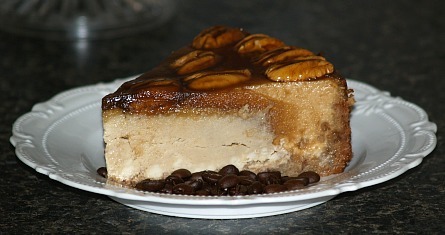 They substituted the plentiful pecans in many of their famous praline recipes like the pecan caramel cheesecake recipe. They also made pralines with chopped pecans (instead of whole) and having a creamy consistency made by combining sugar (most of the time brown sugar), butter and cream. Like fudge after mixing, it can be dropped by spoonfuls to set up. When making praline cheesecake, praline cakes or other recipes these same ingredients are used. Quite honestly to me you just cannot beat the pecan pralines; the almonds and hazelnuts just do not work as well. Whether you call it a pecan caramel cheesecake recipe or a praline cheesecake recipe, this combination is delectable. Try these recipes and see what you think. Pralines are used in many pecan caramel cheesecake recipes. Place pecan halves 3 inches apart on oil sprayed baking sheet. Combine sugar, water and corn syrup in small saucepan. Cook over medium high heat until mixture registers 350F degrees on candy thermometer. Carefully pour small amount of hot syrup over each pecan; let set ten minutes. Use immediately or store pralines between layers of parchment paper in air tight container in freezer. Combine and blend crumbs, granulated sugar, chopped pecans and melted butter. Press mixture in bottom and 1 ½ inches up sides of 9 inch spring form pan. Bake for 10 minutes; cool on wire rack. Beat cream cheese, 1 cup brown sugar, evaporated milk, ½ cup coffee, flour and 1 ½ teaspoon vanilla. Add eggs and beat just until blended; pour into baked crust and bake 50 to 55 minutes or until set. Cool in pan 30 minutes; loosen sides and remove from pan; cool. Arrange pecan halves on top; chill about 8 hours. In saucepan combine corn syrup, ½ cup coffee, cornstarch and remaining brown sugar. Cook stirring constantly until thicken and bubbly; remove from heat and stir in remaining vanilla. Cool and serve over cheesecake. This pecan caramel cheesecake recipe is made easy with a box of butter cake mix. Combine cake mix and butter and blend until crumbly; reserve 1 cup crumbly mixture for topping. Press remaining crumb mixture in bottom and 1 ½ inches up sides of 9 inch spring form pan. Combine cream cheese, sugar, flour and rum and beat until smooth. Stir in crushed candy bars and pour into crust lined pan. Combine reserved crumb mixture, brown sugar and pecans; mix well and sprinkle over filling. Bake for 70 to 85 minutes or until center is set and top is golden brown. Remove from oven and drizzle caramel ice cream topping over the top. Bake for an additional 8 to 10 minutes to set topping. Cool 30 minutes; run knife around pan to loosen sides. Cool completely; remove sides of pan. Refrigerate about 8 hours before serving. Wrap bottom and sides of 10 inch spring form pan with heavy duty foil wrap; grease pan. Process graham crackers and chopped pecan until fine and crumbly. Put crumbs in bowl and stir in 6 tablespoons melted butter; press in bottom of prepared pan. Chill crust for 30 minutes; PREHEAT OVEN TO 325F degrees. Beat cream cheese and 1 ½ cups sugar in large mixing bowl until smooth. Beat into cheese mixture sour cream, milk, flour and 1 tablespoon vanilla. Beat in eggs only until blended; pour over the crust. Place pan in a larger pan and set in oven; add 1 inch hot water to larger pan. Bake for 75 to 80 minutes until center is set. Remove cheesecake from hot water and cool on rack for 10 minutes. Remove foil and run knife around edges to loosen; cool for 1 hour. Combine 1 cup sugar and water in a heavy saucepan over medium low heat. Cook stirring occasionally until sugar begins to melt. Cook about 15 minutes without stirring until mixture turns dark. Reduce the temperature to low and slowly stir in the cream. Cook and stir over medium until temperature reaches 225F degrees. Remove from heat and stir in butter and 1 teaspoon vanilla. Cool mixture to room temperature and spread over top of cheesecake; garnish with pecan halves. Refrigerate overnight; remove sides of pan before serving. Make this pecan caramel cheesecake recipe with a vanilla wafer crust. TO MAKE CRUST combine crumbs, wafers, sugar and butter in small bowl. Blend mixture well; press in bottom of greased 9m inch spring form pan; chill. FOR FILLING combine in large mixing bowl cream cheese and sugar. Beat mixture until smooth; add eggs beating just until combined. Add flour, maple flavoring and vanilla; beat until blended. Stir in the pecans; pour into chilled crust. Place pan on double thickness of foil (About 18 inch square). Securely wrap foil around bottom of pan; place in a larger baking pan. Place both pans on oven rack; fill larger pan with 1 inch hot water. Bake about 40 to 45 minutes until center is set; cool on rack 10 minutes. Run a knife around edge to loosen cake from sides of pan; remove foil. Cool on rack for 1 hour longer; refrigerate overnight. TO MAKE TOPPING combine honey, butter and water in saucepan. Cook and stir mixture over medium heat for 2 minutes. Add the pecans and cook 2 minutes longer (Mixture will be thin). Carefully remove side of pan; place cake on plate. Spoon mixture over the cheesecake; serves 12. Try this pecan caramel cheesecake recipe made with pralines. TO MAKE CRUST combine crumbs, pretzels and pecans. Add melted butter and egg white; stir to blend. Press mixture evenly over bottom and up sides of 9 inch spring form pan. Bake crust 6 minutes; cool completely on rack. REDUCE OVEN TEMPERATURE to 325F degrees. Wrap bottom of pan with double layer of foil securing all sides. Place spring form pan in a larger shallow baking pan; set aside. TO MAKE PECAN PRALINE FILLING use a medium saucepan. Combine the sugar, pecan, corn syrup, butter, eggs, vanilla and salt. Stir mixture well; bring to a boil over medium heat; reduce heat and simmer. Stir mixture constantly until thickened about 8 to 10 minutes. Pour mixture into prepared crust; set aside. TO MAKE CHEESECAKE FILLING beat cream cheese in large bowl with mixer until creamy. Beat in the sour cream; add sugar and flour beating until fluffy. Add eggs one at a time beating after each addition; stir in cream and vanilla. Pour mixture into crust over pecan praline filling; place both pans on rack in oven. Pour hot water in larger pan coming half way up sides of spring form pan. Bake 1 hour and 15 minutes; carefully remove both pans from oven to rack. Let cheesecake stand in the water until water is cool; remove cheesecake to rack. Let cheesecake stand 1 hour at room temperature; refrigerate overnight. Run a knife around edge of pan to loosen cheesecake from sides of pan. Carefully remove the sides of pan. TO MAKE CHOCOLATE GANACHE combine cream , butter and corn syrup in small saucepan. Heat over medium until mixture boils; place chocolate in bowl and pour mixture over top. Whisk chocolate mixture until well combined; spread evenly over top of cheesecake. Let stand about 30 minutes until set; garnish as desired.